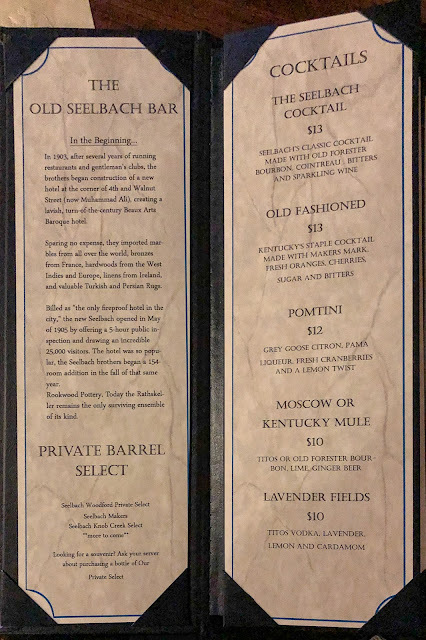 I won't list each stop we made on the Urban Bourbon Trail separately, but The Seelbach Hotel deserves to shine on its own. Another historic downtown Louisville hotel, the Seelbach's history goes back to 1903 when two Bavarian brothers named Louis and Otto Seelbach began construction at the corner of 4th and Walnut Street. 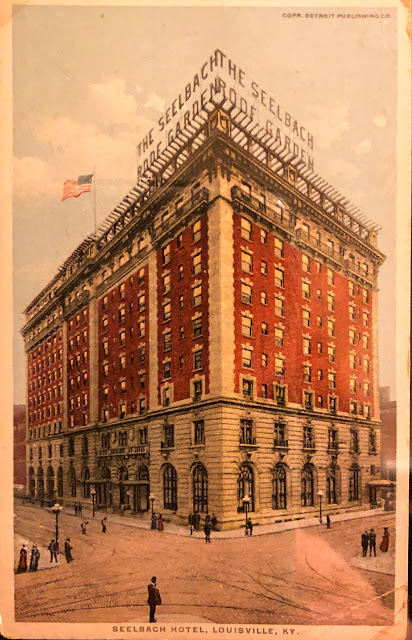 In May of 1905, the Seelbach Hotel celebrated its grand opening, drawing 25,000 visitors to their 5-hour public inspection. 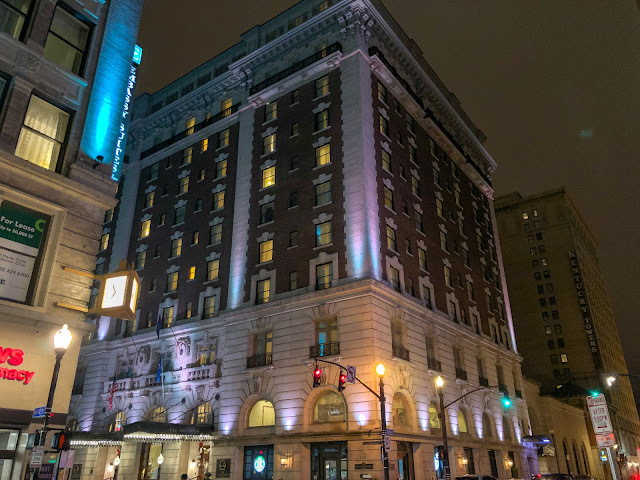 Cincinnati mobster and "King of the Bootleggers" George Remus spent time at The Seelbach during the Roaring 20's where he became friends with writer F. Scott Fitzgerald who often visited the hotel while completing Army training at nearby Camp Taylor. 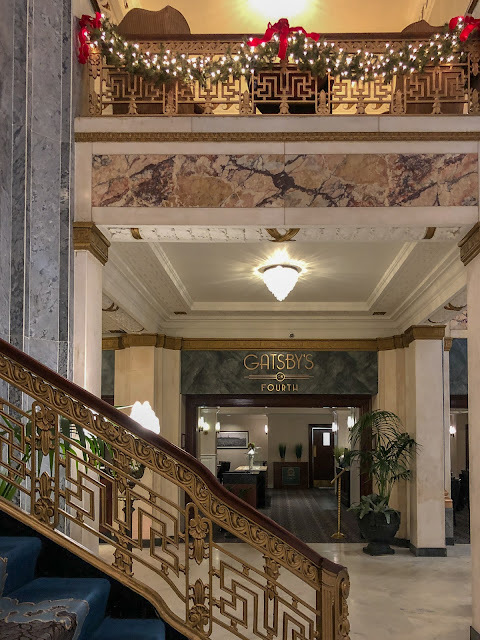 Remus was the inspiration for The Great Gatsby's title character Jay Gatsby, and Fitzgerald referred to The Seelbach and its Grand Ballroom when his characters Tom Buchanan and Daisy were married in Louisville. 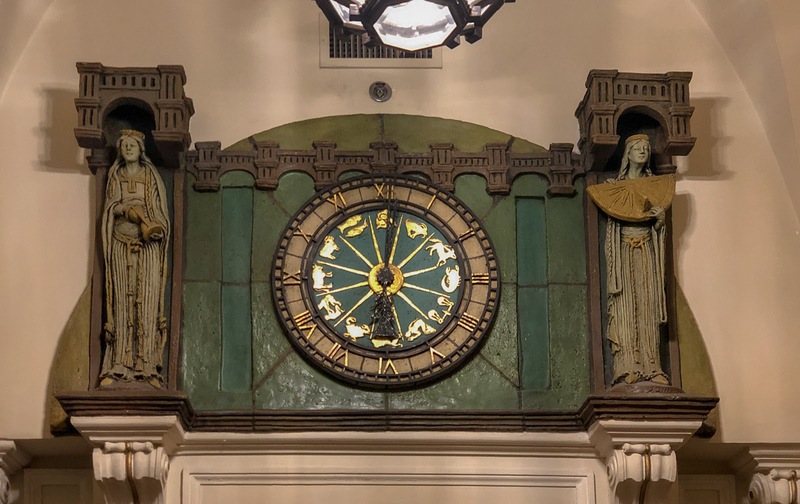 The impressive lobby was constructed with marbles from Italy, Vermont, and Switzerland along with mahogany and bronze in a classic Renaissance style and also features a vaulted dome of 800 glass panes. 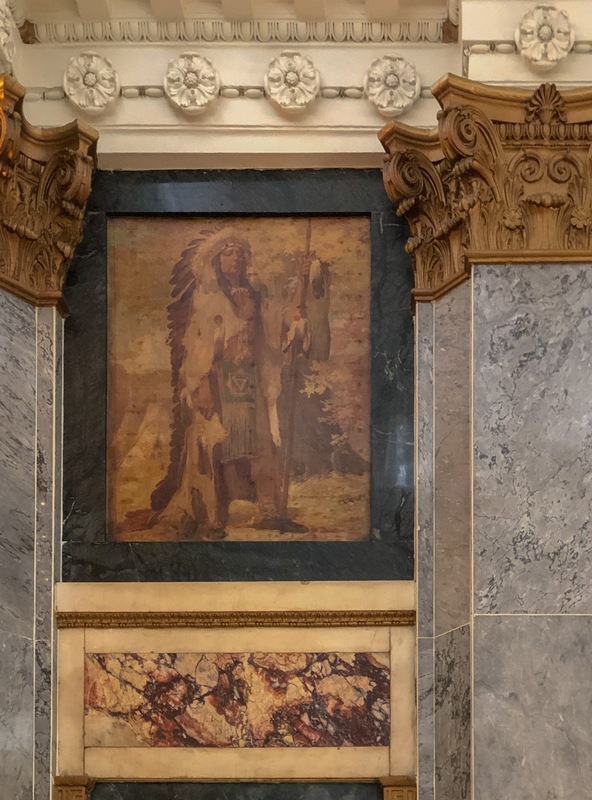 Conrad Arthur Thomas was commissioned to decorate the lobby with huge mural paintings of pioneer scenes from Kentucky history. They looked to be in need of a professional cleaning, and because they were so difficult to see I didn't take many photos, though now I regret that so maybe I should go back someday and look at them again. 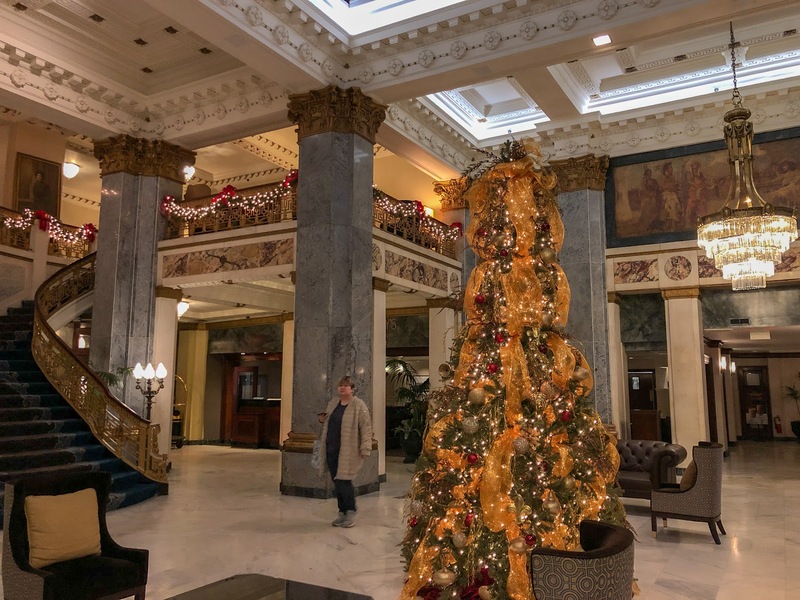 The guest list includes U.S. Presidents William Howard Taft, Woodrow Wilson, Franklin Roosevelt, Harry Truman, John F. Kennedy, Lyndon Johnson, Jimmy Carter, and Bill Clinton. 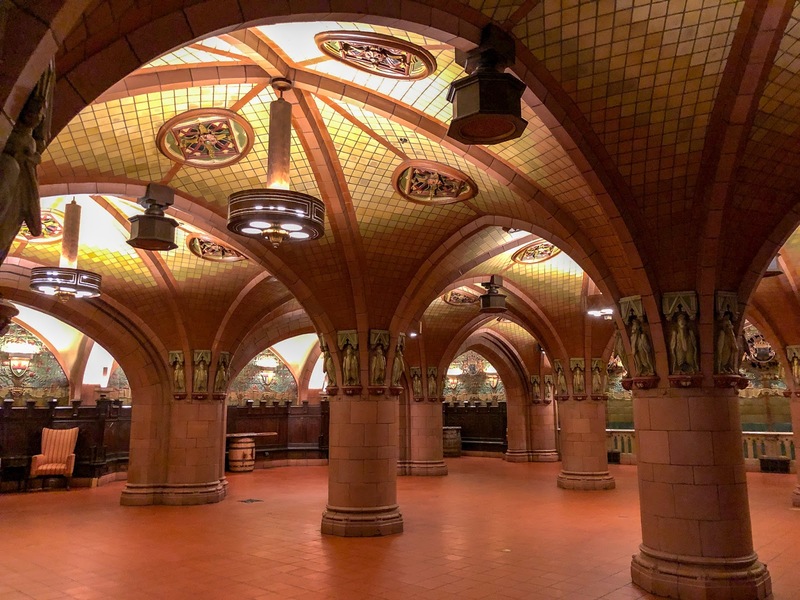 But the Seelbach isn't only famous for its artwork and its guest list, it is home to a basement Rathskeller constructed entirely of Rookwood pottery from floor to ceiling. Well, you know I had to go look at that! The Zodiac clock just outside the room features figures holding a sun dial and an hour glass. The 80 foot square room added in 1907 had a lot to look at. I didn't even notice that the ceiling contained 24k gold painted leather featuring symbols of the Zodiac too. 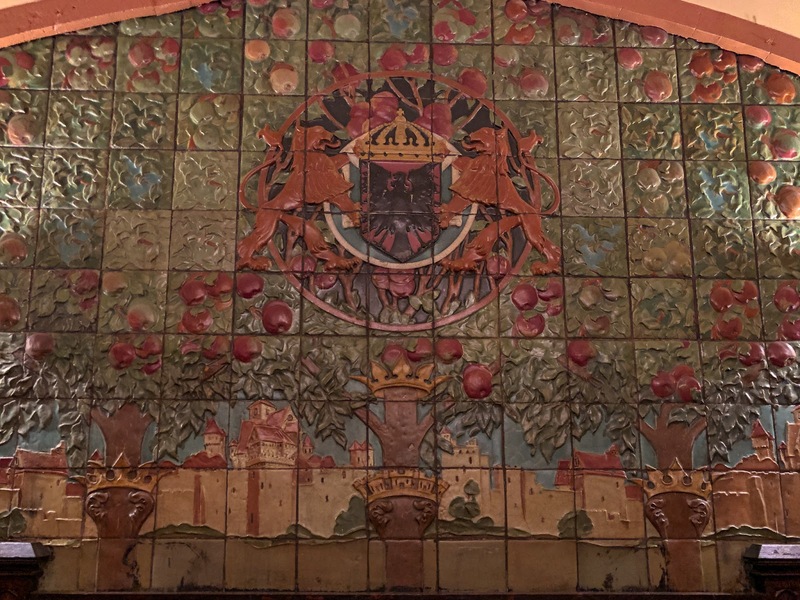 Designs on the pottery were drawn by hand before the clay tiles were fired. 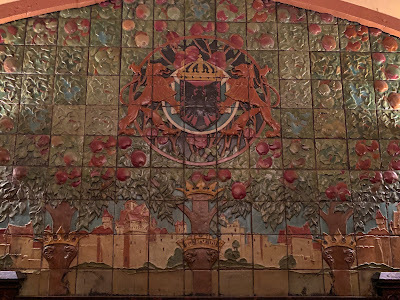 I'm not sure why apples were the theme, grapes I could understand for the making of wine. Of course the owners were Bavarian and I believe that is a major crop in that country. 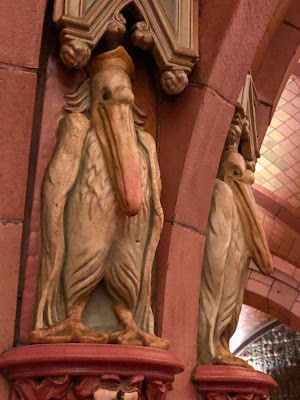 The pelicans were fun, and we were told by the helpful young lady at the front desk to rub one of their noses for good luck. A small display of memorabilia of the hotel was just outside the Rathskeller. I love old postcards! During the Roaring Twenties, The Seelbach was considered the most glamorous spot for cards and leisure. Situated in the center of bourbon and whiskey country, the hotel attracted infamous underworld kingpins and gangsters during Prohibition. Notorious figures included Lucky Luciano and even the most legendary gangster at the time, Al Capone. 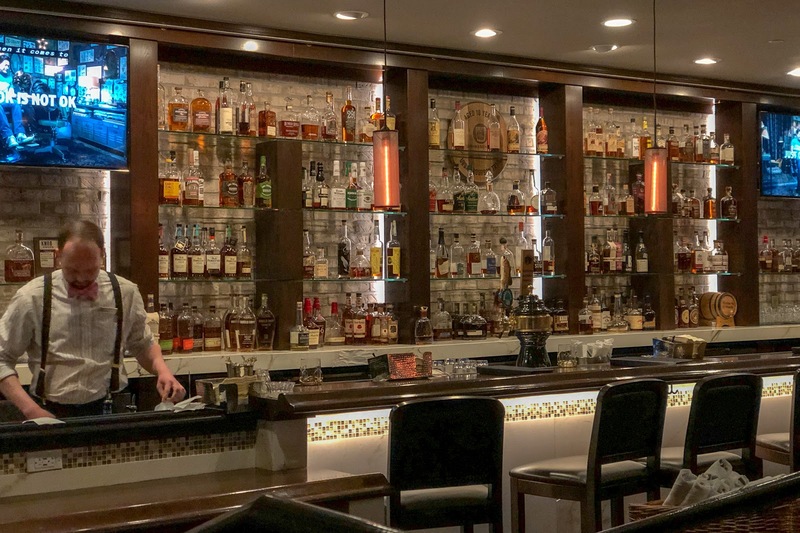 Capone's legacy remains in The Oakroom restaurant, where guests can dine in the small alcove where he played cards. 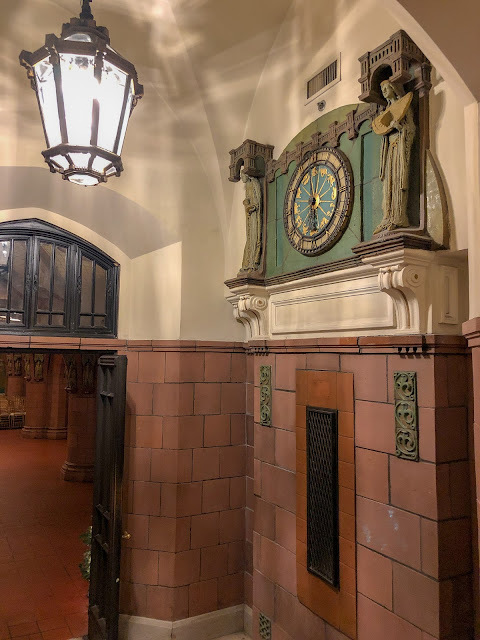 The gangster's favorite room has two hidden doors behind special panels, leading to secret passageways and still displays the large mirror Capone sent from Chicago so that he could watch his back. But wait, didn't we come to have a drink? 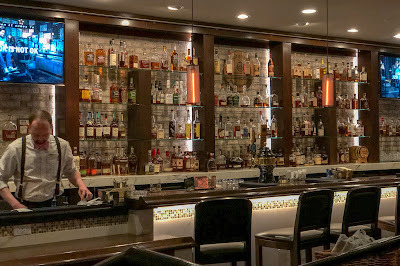 Let's head to the bar and look at the menu. And while we decide, let's hear the story of the re-discovered "lost" Seelbach Cocktail which returned to use when an old menu was found. Imagine my surprise to discover today...that the story is widely known to have been made up by the bartendar in charge in the 1990's. He admitted it himself, after carrying the secret around for decades! 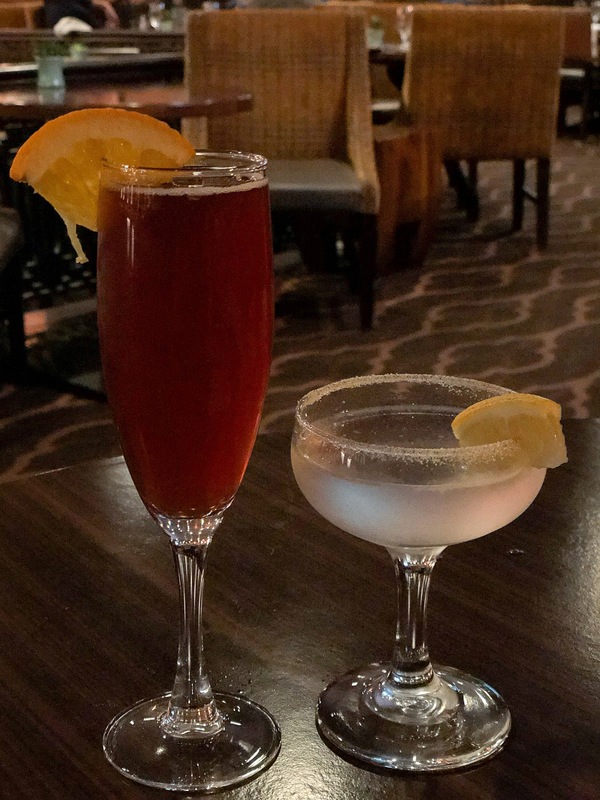 The story was so well told by our bartender that Katrina ordered it, but I opted for the Lavendar Fields. DELICIOUS! Hmmm, first fresh mint with bourbon and then a lavender infused vodka cocktail - I know I will need a greenhouse for herbs when we move to Newfoundland! Christmas in Newfoundland - Not Over Yet!